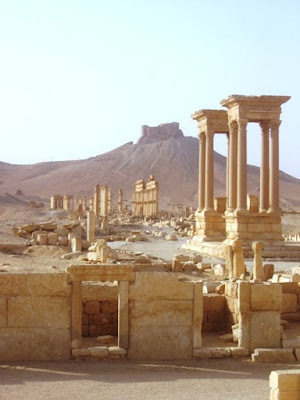 My friend and I spent Easter Sunday in Palmyra, a ruined city at an oasis in the middle of the Syrian desert, about 3 1/2 hours to the east of Damascus. All you see along the road is miles and miles of sand... it's a little bit of a lonely feeling! 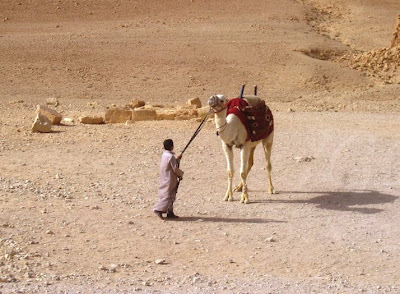 There are Bedouins who live out in the desert with their animals, too, but I didn't see any along the road. 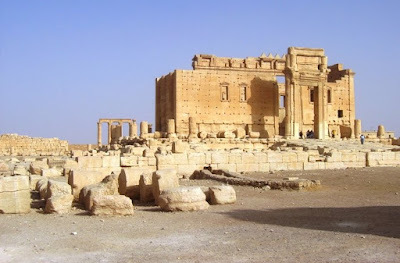 Palmyra is listed in 2nd Chronicles as one of the cities built by King Solomon. 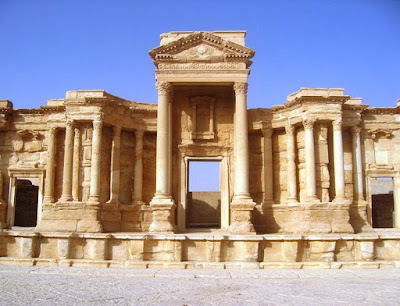 The presence of religious sites where the ruins of the temple stand dates from 2000BC, and the ruins of the temple (dedicated to Baal) date from 32BC. 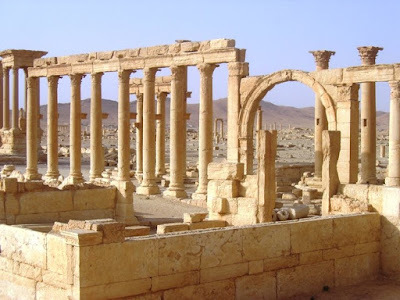 By the mid-1st century AD, Palmyra had become a wealthy city along a prosperous caravan route, and it was conquered by the Romans in 64AD. 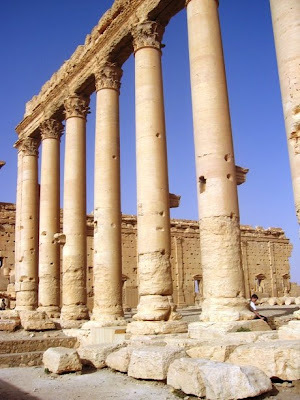 In the 3rd century AD, Queen Zenobia of Palmyra took over Bosra to the south and conquered Egypt to the west. She ruled until 274AD, when Emperor Aurelian of Rome came and captured her in person, taking her to Rome and giving her a villa in Tivoli. 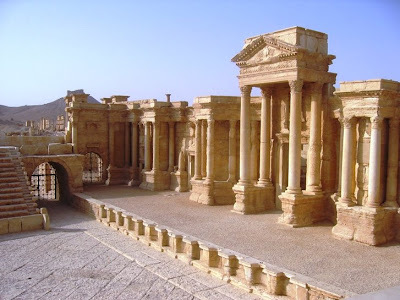 In 634AD, Palmyra fell to the Arabs, but the city began to decline in the 9th century. In 1089AD there was a massive earthquake, and the city was abandoned. 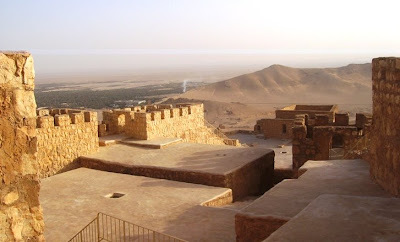 The fortress atop the nearby hill was probably constructed during the 12th or 13th century AD, and the tombs date from the 1st and 2nd centuries AD. 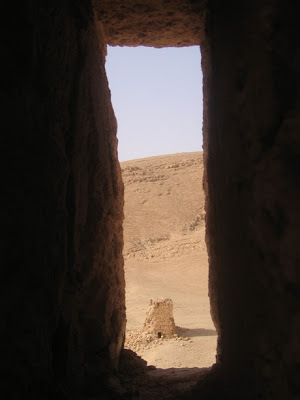 Here's an exterior view of one of the tombs from... well, a window somewhere. There are quite intricate paintings inside that supposedly have never been restored, but it's hard to believe that they'd be in that good of shape almost 2,000 years after they were painted. This is a boy and his camel outside of one of the tombs. I had wanted to go for a camel ride, but we got so flustered about how we were going to get home that we forgot. The sand dunes that surround the city are quite stunning. Palmyra is a small oasis with a palm tree grove and all, but the fact remains that it is smack in the middle of nowhere in the desert. Sand as far as the eye can see. 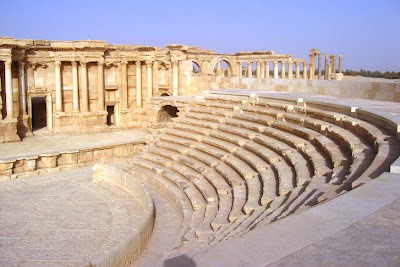 We were actually quite lucky to get back home to Damascus that night... all the public buses were sold out (you can't buy a ticket in advance in Palmyra -- you have to wait until the bus gets there from Deir-es-Zor in the east and see if there are any free seats left!) After circling the city for an hour in a taxi whose driver got out at the bus station two or three times to see if any tickets were available (but who was reluctant to let us out at the station by ourselves because we were girls travelling alone), we finally managed to get on a private bus of Syrian oilmen travelling home from their two-week shift in the east. (Everyone at the bus station told our male taxi driver that there were no tickets available, but as soon as they saw two young ladies travelling alone, they were bound and determined to find a solution for us!) The oilmen whose bus we took were quite curious about us, as it isn't normal for young women to travel alone, especially not a white young woman like me! One of them had spent five years in America working for Conoco, so he fielded all his buddies' questions for us. They turned out to be really nice guys. Magnifique lieu. Merci de nous le faire partager.